Humans are the only ultrasocial creature on the planet. We have outcompeted, interbred or even killed off all other hominin species. We cohabit in cities of tens of millions of people and, despite what the media tell us, violence between individuals is extremely rare. This is because we have an extremely large, flexible and complex “social brain”. To truly understand how the brain maintains our human intellect, we would need to know about the state of all 86 billion neurons and their 100 trillion interconnections, as well as the varying strengths with which they are connected, and the state of more than 1,000 proteins that exist at each connection point. Neurobiologist Steven Rose suggests that even this is not enough – we would still need know how these connections have evolved over a person’s lifetime and even the social context in which they had occurred. It may take centuries just to figure out basic neuronal connectivity. Many people assume that our brain operates like a powerful computer. But Robert Epstein, a psychologist at the American Institute for Behavioural Research and Technology, says this is just shoddy thinking and is holding back our understanding of the human brain. Because, while humans start with senses, reflexes and learning mechanisms, we are not born with any of the information, rules, algorithms or other key design elements that allow computers to behave somewhat intelligently. For instance, computers store exact copies of data that persist for long periods of time, even when the power is switched off. Our brains, meanwhile, are capable of creating false data or false memories, and they only maintain our intellect as long as we remain alive. Of course, we can see many advantages in having a large brain. In my recent book on human evolution I suggest it firstly allows humans to exist in a group size of about 150. This builds resilience to environmental changes by increasing and diversifying food production and sharing. A social brain also allows specialisation of skills so individuals can concentrate on supporting childbirth, tool-making, fire setting, hunting or resource allocation. Humans have no natural weapons, but working in large groups and having tools allowed us to become the apex predator, hunting animals as large as mammoths to extinction. Our social groups are large and complex, but this creates high stress levels for individuals because the rewards in terms of food, safety and reproduction are so great. Hence, Oxford anthropologist Robin Dunbar argues our huge brain is primarily developed to keep track of rapidly changing relationships. It takes a huge amount of cognitive ability to exist in large social groups, and if you fall out of the group you lose access to food and mates and are unlikely to reproduce and pass on your genes. My undergraduates come to university thinking they are extremely smart as they can do differential equations and understand the use of split infinitives. But I point out to them that almost anyone walking down the street has the capacity to hold the moral and ethical dilemmas of at least five soap operas in their head at any one time. And that is what being smart really means. It is the detailed knowledge of society and the need to track and control the ever changing relationship between people around us that has created our huge complex brain. It seems our brains could be even more flexible that we previously thought. Recent genetic evidence suggests the modern human brain is more malleable and is modelled more by the surrounding environment than that of chimpanzees. The anatomy of the chimpanzee brain is strongly controlled by their genes, whereas the modern human brain is extensively shaped by the environment, no matter what the genetics. This means the human brain is pre-programmed to be extremely flexible; its cerebral organisation is adjusted by the environment and society in which it is raised. So each new generation’s brain structure can adapt to the new environmental and social challenges without the need to physically evolve. 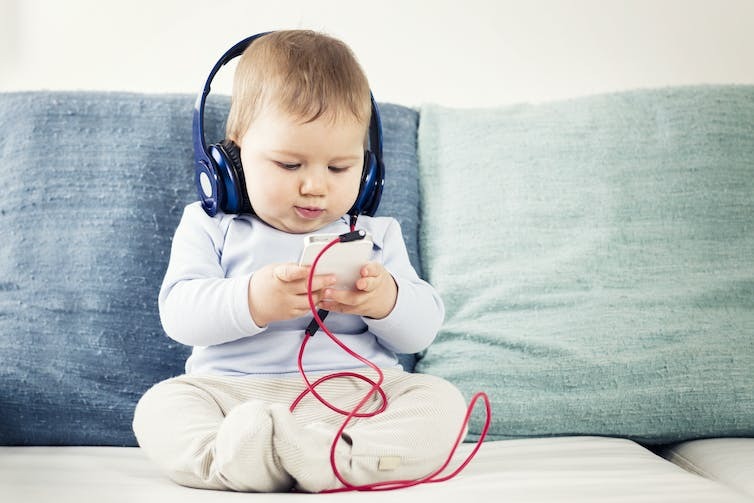 This may also explain why we all complain that we do not understand the next generation as their brains are wired differently, having grown up in a different physical and social environment. An example of this is the ease with which the latest generation interacts with technology almost if they had co-evolved with it. So next time you turn on a computer just remember how big and complex your brain is – to keep a track of your friends and enemies. Equality may counteract the tendency toward groupthink, research suggests. The classic “wisdom of crowds” theory goes like this: If we ask a group of people to guess an outcome, the group’s guess will be better than any individual expert. So, when a group tries to make a decision, in this case, predicting the outcome of an election, the group does a better job than experts. For market predictions, geopolitical forecasting, and crowdsourcing product ideas, the wisdom of crowds has been shown to even outperform industry experts. That is true—as long as people don’t talk to each other. When people start sharing their opinions, their conversations can lead to social influences that produce “groupthink” and destroy the wisdom of the crowd. So says the classic theory. But Damon Centola, an associate professor in the University of Pennsylvania’s Annenberg School for Communication and School of Engineering and Applied Science and director of the Network Dynamics Group, discovered the opposite. When people talk to each other, the crowd can get smarter, report Centola, PhD candidate Joshua Becker, and recent PhD graduate Devon Brackbill in Proceedings of the National Academy of Sciences. “The classic theory says that if you let people talk to each other groups go astray. But,” says Centola, “we find that even if people are not particularly accurate, when they talk to each other, they help to make each other smarter. Whether things get better or worse depends on the networks. An influential opinion leader can hijack the process, leading the entire group astray. While opinion leaders may be knowledgeable on some topics, Centola found that, when the conversation moved away from their expertise, they still remained just as influential. As a result, they ruined the group’s judgment. The online study included more than 1,300 participants, who went into one of three experimental conditions. Some were placed into one of the “egalitarian” networks, where everyone had an equal number of contacts and everyone had equal influence. Others were placed into one of the “centralized” networks, in which a single opinion leader was connected to everyone, giving that person much more influence in the group. Each of the networks contained 40 participants. Finally, Centola had several hundred subjects participate in a “control” group, without any social networks. Then, participants who were in social networks could see the guesses made by their social contacts and could use that information to revise an answer. They could then see their contacts’ revisions and revise their answers again. But this time it was their final answer. Participants were awarded as much as $10 based on the accuracy of their final guess. In the control group, participants did the same thing, but they were not given any social information between each revision. “Thus,” Centola says, “while opinion leaders can sometimes improve things, they were statistically more likely to make the group worse off than to help it. These findings on the wisdom of crowds have startling real-world implications in areas such as climate-change science, financial forecasting, medical decision-making, and organizational design. For example, while engineers have been trying to design ways to keep people from talking to each other when making important decisions in an attempt to avoid groupthink, Centola’s findings suggest that what matters most is the network. A group of equally influential scientists talking to one another will likely lead to smarter judgments than might arise from keeping them independent. He is currently working on implementing these findings to improve physicians’ decision-making. By designing a social network technology for use in hospital settings, it may be possible to reduce implicit bias in physicians’ clinical judgments and to improve the quality of care that they can offer. Whether new technologies are needed to improve the way the groups talk to each other, or whether we just need to be cautious about the danger of opinion leaders, Centola says it’s time to rethink the idea of the wisdom of crowds. Partial support for the work came from the Robert Wood Johnson Foundation. Sabe esse seu cérebro aí na cabeça? Ele não é tão único assim não como a gente imagina e conta com uma grande ajuda de um parceiro para controlar nossas emoções, nosso humor e nosso comportamento. Isso porque o corpo humano tem o que muitos chamam de um “segundo cérebro”. E em um lugar bem especial: na nossa barriga. O “segundo cérebro”, como é chamado informalmente, está situado bem ao longo dos nove metros de seu intestino e reúne milhões de neurônios. Na verdade, faz parte de algo com uma nomenclatura um pouquinho mais complicada: o Sistema Nervoso Entérico. Uma das razões principais para ele ser considerado um cérebro é a grande e complexa rede de neurônios existentes nesse sistema. Para se ter uma ideia, nós temos ali entre 200 milhões e 600 milhões de neurônios, de acordo com pesquisadores da Universidade de Melbourne, na Austrália, que trabalham em conjunto com o cérebro principal. As funções desse cérebro são várias e ocorrem de forma autônoma e integrada ao grande cérebro. Antes, imaginava-se que o cérebro maior enviava sinais para comandar esse outro cérebro, Mas, na verdade, é o contrário: o cérebro em nosso intestino envia sinais por meio de uma grande “rodovia” de neurônios para a cabeça, que pode aceitar ou não as indicações. “O cérebro de cima pode interferir nesses sinais, modificando-os ou inibindo-os. Há sinais de fome, que nosso estômago vazio envia para o cérebro. Tem sinais que mandam a gente parar de comer quando estamos cheios. Se o sinal da fome é ignorado, pode gerar a doença anorexia, por exemplo. O mais comum é o de continuar comendo, mesmo depois que nossos sinais do estômago dizem ‘ok, pare, transferimos energia suficiente'”, complementa Watzke. A quantidade de neurônios assusta, mas faz sentido se pensarmos nos perigos da alimentação. Assim como a pele, o intestino tem que parar imediatamente potenciais invasores perigosos em nosso organismo, como bactérias e vírus. Esse segundo cérebro pode ativar uma diarreia ou alertar o seu “superior”, que pode decidir por acionar vômitos. É um trabalho em grupo e de vital importância. É claro que uma das funções principais tem a ver com a nossa digestão e excreção – como se o cérebro maior não quisesse “sujar as mãos”, né? Ele inclusive controla contrações musculares, liberação de substâncias químicas e afins. O segundo cérebro não é usado em funções como pensamentos, religião, filosofia ou poesia, mas está ligado ao nosso humor. O sistema entérico nervoso nos ajuda a “sentir” nosso mundo interior e seu conteúdo. Segundo a revista Scientific American, é provável que boa parte das nossas emoções sejam influenciadas por causa dos neurônios em nosso intestino. Já ouviu a expressão “borboletas no estômago”? A sensação é um exemplo disso, como uma resposta a um estresse psicológico. É por conta disso que algumas pesquisas tentam até tratamento de depressão atuando nos neurônios do intestino. O sistema nervoso entérico tem 95% de nossa serotonina (substância conhecida como uma das responsáveis pela felicidade). Ele pode até ter um papel no autismo. Há ainda relatos de outras doenças que possam ter a ver com esse segundo cérebro. Um estudo da Nature em 2010 apontou que modificações no funcionamento do sistema podem evitar a osteoporose. O “segundo cérebro” tem como uma de suas principais funções a defesa do nosso corpo, já que é um dos grandes responsáveis por controlar nossos anticorpos. Um estudo de 2016 com apoio da Fapesp mostrou como os neurônios se comunicam com as células de defesa no intestino. Há até uma “conversa” com micróbios, já que o sistema nervoso ajuda a ditar quais deles podem habitar o intestino. Pesquisas apontam que a importância do segundo cérebro é realmente enorme. Em uma delas, foi percebido que ratos recém-nascidos cujos estômagos foram expostos a um químico irritante são mais depressivos e ansiosos do que outros ratos, com os sintomas prosseguindo por um bom tempo depois do dano físico. O mesmo não ocorreu com outros danos, como uma irritação na pele. Com tudo isso em vista, tenho certeza que você vai olhar para suas vísceras de uma maneira diferente agora, né? Pensa bem: na próxima vez que você estiver estressado ou triste e for comer aquela comida bem gorda para confortar, pode não ser culpa só da sua cabeça. Assim como muitos observadores internacionais acompanhando os Jogos Olímpicos do Rio, o sociólogo americano Peter Kaufman ficou espantado com o episódio das vaias ao atleta francês do salto com vara Renaud Lavillenie. No caso do acadêmico, porém, o que pareceu incomodá-lo mais foi a reação contrária ao comportamento da torcida. Para o professor da Universidade Estadual de Nova York, que escreve sobre sociologia do esporte e estudou as reações do público ao comportamento de atletas, houve exagero na condenação das manifestações, sobretudo depois do “pito” público dado nos brasileiros pelo presidente do Comitê Olímpico Internacional (COI), o alemão Thomas Bach. Após as vaias a Lavillenie no pódio, Bach usou a conta do COI no Twitter para dizer que o comportamento do público foi “chocante” e “inaceitável nas Olimpíadas”. “O COI certamente tem questões bem mais importantes para lidar do que vaias de torcedores”, disse Kaufman, em conversa com a BBC Brasil, por telefone. BBC Brasil – O senhor acompanhou a polêmica das vaias no Brasil? Peter Kaufman – Sim, porque houve um repercussão considerável de alguns incidentes envolvendo o público na Olimpíada do Rio. O comportamento de torcedores é algo interessante, porque estão em jogo fatores culturais. Cada cultura tem seus próprios valores: em algumas, é apropriado beijar em vez de apertar a mão quando se é apresentado a alguém, por exemplo. Em outras, é muito aceitável vaiar, assim como em certos países aplausos efusivos podem ser vistos como algo rude. BBC Brasil – Por que as pessoas vaiam? Kaufman – É uma questão de expressão, uma forma de interação social e participação. E isso varia de lugar para lugar. Se um alienígena chegasse aqui hoje e fosse assistir a uma competição esportiva, possivelmente teria outra maneira de se comportar de acordo com sua realidade. E, óbvio, sabemos que não é apenas esporte. As Olimpíadas têm um significado muito maior. O público brasileiro pode estar vaiando em desafio às autoridades, ao governo brasileiro e até mesmo ao dinheiro gasto na Olimpíada. BBC Brasil – É injusto com os atletas? Kaufman – Alvos de vaias podem se sentir ofendidos, tristes e até ameaçados por uma torcida mais ruidosas. Não os culpo por pensarem apenas na qualidade de seu desempenho em vez de analisar aspectos culturais ou políticos. É perfeitamente compreensível que o atleta francês tenha ficado bastante chateado com as vaias que recebeu até no pódio. Mas ele estava competindo contra um atleta brasileiro e em casa. Pelo que tenho lido sobre a torcida brasileira, era inevitável que ele fosse alvo dessas manifestações. (Reclamar das vaias) seria uma atitude de imperialismo cultural. Por que a maneira do brasileiro torcer é errada? BBC Brasil – Renaud Lavillenie não foi a primeira “vítima” e não deverá ser a última, mas o comportamento da torcida no Estádio Olímpico, em especial durante provas em que normalmente o silêncio do público é uma questão de etiqueta, como o tênis e a esgrima, irritou até o presidente do COI, Thomas Bach. Como achar um meio termo? Kaufman – Olha, é irônico que sentimentos de nacionalismo e tribalismo surjam na Olimpíada, uma competição concebida em sua forma moderna para promover a paz e a união ente os povos. Mas o esporte é passional e excitante. As pessoas querem vaiar seu adversário para tentar afetar o resultado de uma partida. E, como costuma ser o caso por causa das rivalidades locais, os brasileiros “pegaram no pé dos argentinos”. Também vimos o público vaiando atletas russos por causa da controvérsia envolvendo o doping. As vaias, por sinal, são o menor dos problemas que o COI tem para resolver. BBC Brasil – Mas Lavillenie não teria razão ao reclamar do barulho durante o momento de seus saltos? Não seria preciso criar uma cultura de torcida mais apropriada para o esporte olímpico? Kaufman – Isso seria uma atitude de imperialismo cultural. Por que a maneira do brasileiro torcer é errada? A realidade que conhecemos é criada pelo ambiente em que crescemos. Você mencionou o tênis anteriormente: será que não vale a pena discutirmos a razão para o silêncio durante o saque no tênis enquanto no futebol a torcida pode urrar nos ouvidos de um atacante que vai bater um pênalti? A diferença é que o tênis é um esporte muito mais elitizado. Qual a razão para o silêncio durante o saque no tênis enquanto no futebol a torcida pode urrar nos ouvidos de um atacante que vai bater um pênalti? A diferença é que o tênis é um esporte muito mais elitizado. 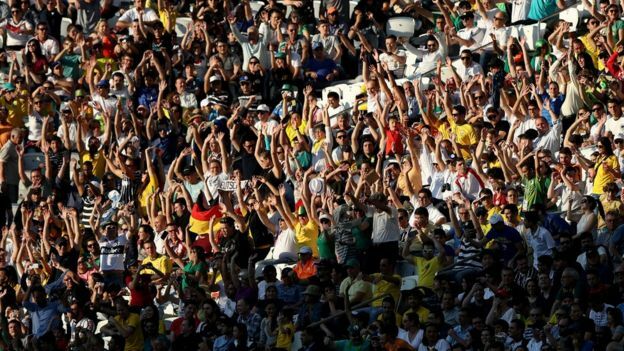 BBC Brasil: O senhor defende o comportamento da torcida, então? Kaufman: De certa maneira, sim, apesar de que os esportes têm regras para lidar com isso. Acho fascinante o fato de que as normas de comportamento podem ser diferentes. Fica a impressão de que o COI foi pego de surpresa pela passionalidade do torcedor brasileiro. Mas lembremos da Copa do Mundo de 2010, em que as vuvuzelas do torcedor sul-africano criaram um problema até para quem viu os jogos pela TV. Mas ter proibido seu uso teria amputado um componente cultural. Vaiar é uma expressão de crenças e valores. É tão “errado” quanto torcer. Da esgrima à natação, do basquete ao tênis, atletas foram intensamente vaiados no Rio de Janeiro. E enquanto as vaias são comuns na maioria das Olimpíadas – apesar da ideia de que seja um momento em que o espírito esportivo deve reinar -, já está claro que a Rio 2016 é mais barulhenta que os Jogos mais recentes. O público brasileiro tem uma tendência a escolher ” um lado” – torcer por um time, ou um atleta, e vaiar os rivais. Mas eles podem trocar essa lealdade num piscar de olhos. “Os torcedores brasileiros parecem ser bem igualitários. Eles são capazes de vaiar atletas de muitos países. É muito difícil de identificar o porquê da vaia a um outro atleta”, disse o diretor de comunicação do Comitê Olímpico Internacional, Mark Adams. A mesma reação foi identificada pelo especialista em Jogos Olímpicos da Universidade de Salford, Andy Miah. “Eu fiquei surpreso com o quanto eles são verbais e achei uma falta de espírito esportivo toda essa gritaria e vaia. Até eu perceber que era a forma que eles encontraram de se envolver com o drama do evento”, diz. “Não é malicioso. Eu estava na esgrima ontem e eles estavam vaiando os jogadores e depois torcendo muito e apoiando muito quando eles ganharam. É tudo parte do teatro que é o que eles curtem”. Ele ainda opina que há diferenças com Londres 2012: “era muito mais quieto, quase nunca tinha gritaria, só aplausos”. 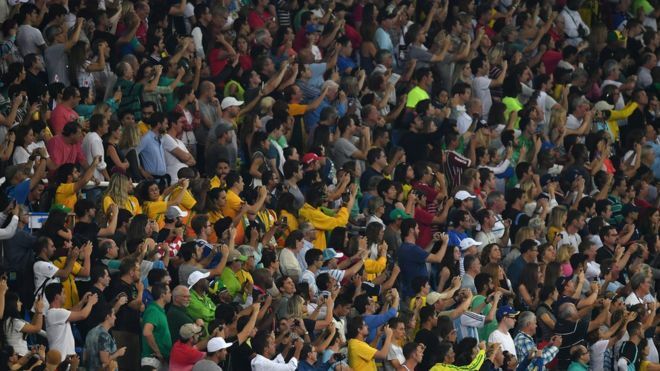 O público na Rio 2016 demonstrou uma clara preferência pelos azarões. 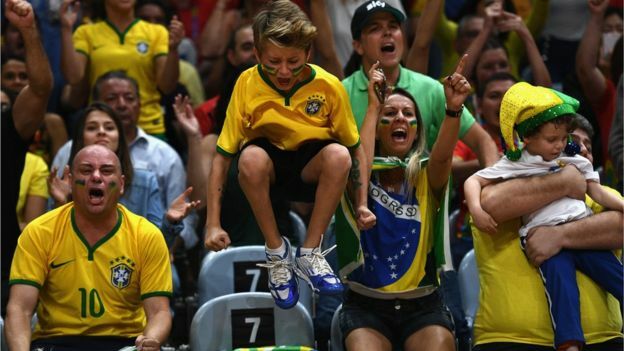 Em uma das primeiras partidas de basquete, os torcedores apoiaram a Croácia enquanto vaiavam os favoritos – a seleção espanhola. A Espanha então começou a perder e foi derrotada por 72-70. Esse não é um fenômeno novo. Durante a Olimpíada de Atenas, em 2004, por exemplo, os torcedores apoiaram a equipe de futebol masculino do Iraque – durante uma semifinal contra o Paraguai – e vaiavam cada vez que os paraguaios ficavam com a bola. De acordo com o professor de história da mídia da Universidade de Sussex, na Inglaterra, David Hendy, a vaia é “uma tradição nobre” e um lembrete de que o espetáculo é sobretudo para o público, mais do que para os competidores. “E o público sempre vê tudo em termos dramáticos – um conflito entre heróis e vilões”, explica. Por causa a revelação de um esquema estatal de doping e da decisão do Comitê Olimípico de não suspender todos os atletas, os russos encontraram uma reação particularmente hostil do público no Rio de Janeiro. 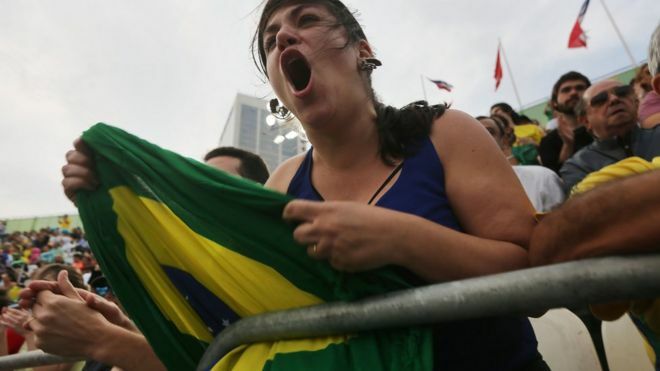 As vaias começaram logo na entrada da delegação russa no Maracanã durante a cerimônia de abertura. “Os russos sempre iriam ser vaiados porque muitos pensam que o COI não deveria ter comprometido os Jogos”, diz Andy Miah. A nadadora russa Yulia Efimova, que foi banida por 16 meses em 2013 e conquistou o direito de competir novamente no Rio de Janeiro depois de apelar ao Tribunal Arbitral do Esporte, foi vaiada durante toda a competição dos 100 metros peito nas eliminatórias e na final, na qual levou a medalha de prata. Ela caiu no choro depois que o ouro foi para a americana Lily King, que comentou: “isso só prova que você pode competir limpa e ainda chegar ao topo do pódio”. O boxeador russo Evgeny Tishchenko demonstrou frustração com a reação negativa do público aos atletas russos. “É uma pena que o público se comporte dessa forma, apoiando quem quer que esteja contra a Rússia”, disse ele ao jornal Chicago Tribune. “Estou bastante irritado com isso. É a primeira vez que eu enfrento esse tipo de tratamento. Para falar a verdade, estou um pouco decepcionado”. 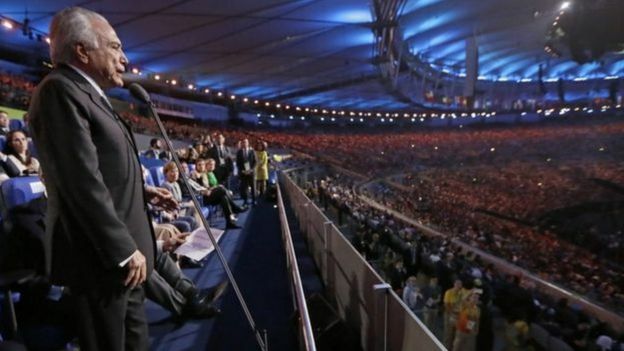 Ao declarar os Jogos Olímpicos abertos na cerimônia de abertura, o presidente interino Michel Temer foi vaiado. Temer assumiu em maio depois da suspensão de Dilma Rousseff e foi vaiado apesar dito apenas uma frase. Mas as vaias quase se dissiparam em meio aos fogos de artíficio e à música, até porque o nome de Temer não chegou a ser anunciado. Mas essa não é a primeira vez que uma Olimpíada é um catalisador para a insatisfação com a elite política de um país. O ex-chanceler George Osborne e a então ministra do Interior – e atual premiê – Theresa May foram vaiados na entrega de medalhas durante a Paralimpíada de Londres 2012. “Foi uma resposta visceral e instantânea de um público indignado com as políticas para os deficientes físicos e que se sentiam sem voz”, diz Hendy. 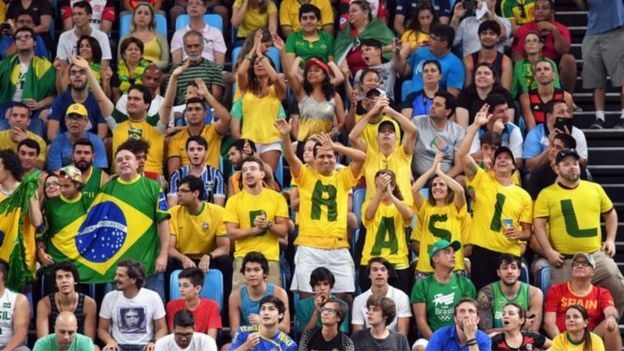 Os fãs brasileiros foram rápidos em demonstrar apoio aos atletas nativos ao vaiarem vigorosamente seus oponentes. O tenista alemão Dustin Brown foi vaiado até depois de cair e torcer o tornozelo durante uma partida com Thomaz Bellucci, apesar de ter recebido aplausos e apoio quando se levantou para ser levado ao hospital. O francês Renaud Lavillenie queixou-se publicamente da vaias que ouviu no Engenhão na noite em que perdeu de Thiago Braz no salto com varas. “Dei tudo de mim e não tenho nenhum arrependimento. Uma prova inacreditável! Só estou decepcionado com a total falta de respeito do público. Isso não é digno de um estádio olímpico”, afirmou. “As Olimpíadas sempre foram sinônimo de respeito internacional. Então as vaias podem distrair e até evitar que os atletas tenham o melhor desempenho”, diz Rhonda Cohen, psicóloga do esporte da Universidade de Middlesex, na Inglaterra. O boxeador camaronês Hassan N’Dam N’Jijam certamente não ficou feliz ao perder a luta contra o brasileiro Michel Borges depois de muitas vaias pantomímicas. Segundo ele, o barulho pode ter influenciado os juízes. Os atletas argentinos também foram vaiados durante a cerimônia de abertura só porque são… argentinos – nossos vizinhos e rivais, especialmente no futebol. E há o caso da goleira da seleção feminina de futebol dos Estados Unidos, Hope Solo, que postou fotos nas redes sociais falando sobre o vírus da Zika e foi vaiada ao coro de “Zika!”durante a partida contra a Nova Zelândia. Mas os torcedores não reservaram as vaias apenas aos estrangeiros. A performance ruim dos jogadores brasileiros da seleção de futebol também provocou vaias depois das partidas contra a África do Sul e o Iraque. Até os juízes olímpicos caíram nas vaias do público brasileiro. Como anfitriões, os brasileiros conquistaram uma vaga na final do salto sincronizado de 10 metros masculino, apesar de os atletas não terem chances na competição. Inevitavelmente, os juízes consistentemente deram notas baixas, gerando vaias nervosas do público. Mas vale lembrar que nada se compara à final de ginástica masculina em Atenas 2004. O russo Alexei Nemov animou o público com uma rotina de barras arriscada, e, quando os juízes o avaliaram com notas baixas, ouviu vaias por sete minutos ininterruptos. A belief in the paranormal can mean an individual experiences more déjà vu moments in their life. This is one of the findings of a study by 3rd year undergraduate student Chloe Pickles and Dr Mark Moss, of Northumbria University, who will present their poster today, Thursday 28 April 2016, at the British Psychological Society’s annual conference in Nottingham. Over 100 participants completed surveys relating to perceived stress, belief in paranormal experiences and beliefs about déjà vu. Analysis of the results showed a strong link between belief in paranormal experiences and the frequency, pleasantness and intensity of déjà vu experiences. Stress was linked significantly to intensity and duration only. People who empathize easily with others do not necessarily understand them well. To the contrary: Excessive empathy can even impair understanding as a new study conducted by psychologists has established. People who empathize easily with others do not necessarily understand them well. To the contrary: Excessive empathy can even impair understanding as a new study conducted by psychologists from Würzburg and Leipzig has established. Imagine your best friend tells you that his girlfriend has just proposed “staying friends.” Now you have to accomplish two things: Firstly, you have to grasp that this nice sounding proposition actually means that she wants to break up with him and secondly, you should feel with your friend and comfort him. Whether empathy and understanding other people’s mental states (mentalising) — i.e. the ability to understand what others know, plan and want — are interrelated has recently been examined by the psychologists Anne Böckler, Philipp Kanske, Mathis Trautwein, Franca Parianen-Lesemann and Tania Singer. Anne Böckler has been a junior professor at the University of Würzburg’s Institute of Psychology since October 2015. Previously, the post-doc had worked in the Department of Social Neurosciences at the Max Planck Institute of Human Cognitive and Brain Sciences in Leipzig where she conducted the study together with her co-workers. In the scientific journal Social Cognitive and Affective Neuroscience, the scientists present the results of their work. “Successful social interaction is based on our ability to feel with others and to understand their thoughts and intentions,” Anne Böckler explains. She says that it had been unclear previously whether and to what extend these two skills were interrelated — that is whether people who empathise easily with others are also capable of grasping their thoughts and intentions. According to the junior professor, the scientists also looked into the question of whether the neuronal networks responsible for these abilities interact. Answers can be gleaned from the study conducted by Anne Böckler, Philipp Kanske and their colleagues at the Max Planck Institute in Leipzig within the scope of a large-scale study led by Tania Singer which included some 200 participants. The study enabled the scientists to prove that people who tend to be empathic do not necessarily understand other people well at a cognitive level. Hence, social skills seem to be based on multiple abilities that are rather independent of one another. The study also delivered new insight as to how the different networks in the brain are orchestrated, revealing that networks crucial for empathy and cognitive perspective-taking interact with one another. In highly emotional moments — for example when somebody talks about the death of a close person — activation of the insula, which forms part of the empathy-relevant network, can have an inhibiting effect in some people on brain areas important for taking someone else’s perspective. And this in turn can cause excessive empathy to impair social understanding. The participants to the study watched a number of video sequences in which the narrator was more or less emotional. Afterwards, they had to rate how they felt and how much compassion they felt for the person in the film. Then they had to answer questions about the video — for example what the persons could have thought, known or intended. Having thus identified persons with a high level of empathy, the psychologists looked at their portion among the test participants who had had good or poor results in the test about cognitive perspective-taking — and vice versa. Using functional magnetic resonance imaging, the scientists observed which areas of the brain where active at what time. The authors believe that the results of this study are important both for neuroscience and clinical applications. For example, they suggest that training aimed at improving social skills, the willingness to empathise and the ability to understand others at the cognitive level and take their perspective should be promoted selectively and separately of one another. The group in the Department of Social Neurosciences in Leipzig is currently working on exactly this topic within the scope of the ReSource project, namely how to specifically train different social skills. Summary: Problems of anti-social behavior, privacy, and free speech on social media are not caused by anonymity but instead result from the way technology changes our presence. That’s the startling conclusion of a new book by an expert on the information society and developing media. Problems of anti-social behaviour, privacy, and free speech on social media are not caused by anonymity but instead result from the way technology changes our presence. That’s the startling conclusion of a new book by Dr Vincent Miller, a sociologist at the University of Kent and an expert on the information society and developing media. In contending that the cause of issues such as online anti-social behaviour is the design/software of social media itself, Dr Miller suggests that social media architecture needs to be managed and planned in the same way as physical architecture. In the book, entitled The Crisis of Presence in Contemporary Culture: Ethics, Privacy and Speech in Mediated Social Life, Dr Miller examines the relationship between the freedom provided by the contemporary online world and the control, surveillance and censorship that operate in this environment. The book questions the origins and sincerity of moral panics about use — and abuse — in the contemporary online environment and offers an analysis of ethics, privacy and free speech in this setting. Investigating the ethical challenges that confront our increasingly digital culture, Dr Miller suggests a number of revisions to our ethical, legal and technological regimes to meet these challenges. These including changing what he describes as ‘dehumanizing’ social media software, expanding the notion of our ‘selves’ or ‘bodies’ to include our digital traces, and the re-introduction of ‘time’ into social media through the creation of ‘expiry dates’ on social media communications. Dr Miller is a Senior Lecturer in Sociology and Cultural Studies within the University’s School of Social Research, Sociology and Social Policy. The Crisis of Presence in Contemporary Culture: Ethics, Privacy and Speech in Mediated Social Life, is published by Sage. Weather is not as objective an occurrence as it might seem. People’s perceptions of what makes weather extreme are influenced by where they live, their income, as well as their political views, a new study finds. There is a difference in both seeing and believing in extreme weather events, according to the study in the journal Environmental Sociology. 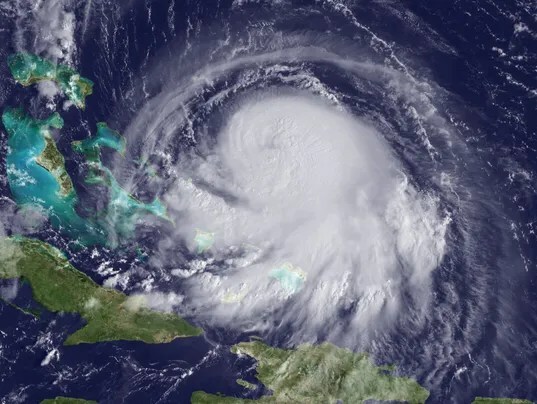 “Odds were higher among younger, female, more educated, and Democratic respondents to perceive effects from extreme weather than older, male, less educated, and Republican respondents,” said the study’s author, Matthew Cutler of the University of New Hampshire. There were other correlations, too. For example, people with lower incomes had higher perceptions of extreme weather than people who earned more. Those who live in more vulnerable areas, as might be expected, interpret the effects of weather differently when the costs to their homes and communities are highest. Causes of extreme weather and the frequency of extreme weather events is an under-explored area from a sociological perspective. Better understanding is important to building more resilient and adaptive communities. After all, why prepare or take safety precautions if you believe the weather isn’t going to be all that bad or occur all that often? The U.S. Climate Extremes Index, compiled by the National Oceanic and Atmospheric Administration (NOAA), shows a significant rise in extreme weather events since the 1970s, the most back-to-back years of extremes over the past decade since 1910, and all-time record-high levels clocked in 1998 and 2012. Indeed, there is a faction of the public that debates how much the climate is changing and which factors are responsible for such consequences as global warming. Weather, on the other hand, is a different order of things: it is typically defined in the here and now or in the immediate future. It also is largely confined, because of its variability, to local or regional areas. Moreover, weather is something we usually experience directly. Climate is a more abstract concept, typically defined as atmospheric conditions over a 30-year period. When weather isn’t experiential, reports are relied upon to gauge extremes. This is when beliefs become more muddied. “The patterns found in this research provide evidence that individuals experience extreme weather in the context of their social circumstances and thus perceive the impacts of extreme weather through the lens of cultural and social influences. In other words, it is not simply a matter of seeing to believe, but rather an emergent process of both seeing and believing — individuals experiencing extreme weather and interpreting the impacts against the backdrop of social and economic circumstances central to and surrounding their lives,” Cutler concludes. Sophocles said, “what people believe prevails over the truth.” The consequences of disbelief come at a price in the context of extreme weather, however, as damage, injury, and death are often results. Too many times do we hear about people being unprepared for storms, ignoring officials’ warnings, failing to evacuate, or engaging in reckless behavior during weather extremes. There is a need to draw a more complete picture of “weather prejudice,” as I’ll call it, in order to render more practical advice about preparing, surviving, and recovering from what is indisputable: extreme weather disasters to come. Thomas M. Kostigen is the founder of TheClimateSurvivalist.com and a New York Times bestselling author and journalist. He is the National Geographic author of “The Extreme Weather Survival Guide: Understand, Prepare, Survive, Recover” and the NG Kids book, “Extreme Weather: Surviving Tornadoes, Tsunamis, Hailstorms, Thundersnow, Hurricanes and More!” Follow him @weathersurvival, or email kostigen@theclimatesurvivalist.com. The Interdisciplinary Affective Science Laboratory (which I direct) collectively analyzed brain-imaging studies published from 1990 to 2011 that examined fear, sadness, anger, disgust and happiness. We divided the human brain virtually into tiny cubes, like 3-D pixels, and computed the probability that studies of each emotion found an increase in activation in each cube. Overall, we found that no brain region was dedicated to any single emotion. We also found that every alleged “emotion” region of the brain increased its activity during nonemotional thoughts and perceptions as well . . .
Emotion words like “anger,” “happiness” and “fear” each name a population of diverse biological states that vary depending on the context. When you’re angry with your co-worker, sometimes your heart rate will increase, other times it will decrease and still other times it will stay the same. You might scowl, or you might smile as you plot your revenge. You might shout or be silent. Variation is the norm. In short, concepts are flexible and distributed modes of bodily organization grounded in modality-specific regions of the brain; they comprise semantic knowledge embodied in perception and action; and they underwrite the organization of sensory experience and guide action within an environment. Concepts are tools for constructing in the mind new pathways of relationship and discrimination, for shaping the body, and for attuning it to contrast. Such pathways are recruited in an ecologically specific way as part of the dynamic bringing-to-apprehension of phenomena. I think the parallel is clear enough, and we would do well to adopt this more ecological view of emotions and concepts into our thinking. The empirical data is giving us a strong argument for talking about the ecological basis of emotion and conceptuality, a basis that continues to grow stronger by the day. For any practicing or aspiring anthropologist, fieldwork is the defining, almost qualifying practice of the discipline. As an undergraduate studying sociocultural anthropology, we read the seminal journals of Bronislaw Malinowski, followed by foundational ethnographic research from around the world. Even though the field has ostensibly moved beyond the “exotic”—no longer wholly consumed with discovering new indigenous communities or uncovering a culture untouched by capitalism and globalization—students are still encouraged to conduct their fieldwork in remote, isolated, and, yes, tacitly exotic locations. As my professor lectured during my Anthropology Senior Seminar at Vassar College, you have to conduct your first fieldwork abroad if you want to be taken seriously as an anthropologist. The implication was that if you don’t go somewhere distant and strange, you won’t experience the same level of cultural difference, linguistic estrangement, physical hardship, and existential negotiation that molds the student into a consummate ethnographer. Fieldwork, rather than being a praxis for cultural research, has rather become the test for one’s anthropological training and credentials. Yet, throughout my undergraduate degree, we never discussed the emotional or physical challenges of fieldwork—it was always framed as this transformative, clarifying experience during which the theory we worked so assiduously to grasp could finally be applied. It was understood that everyanthropologist inherently falls in love with their site, integrates into their chosen community, and concludes their fieldwork with a sense of kinship and satisfaction at the rich ethnographic data and knowledge they have been able to accumulate. This silence surrounding the very real personal challenges of fieldwork can, however, be detrimental to a student’s first foray into fieldwork. 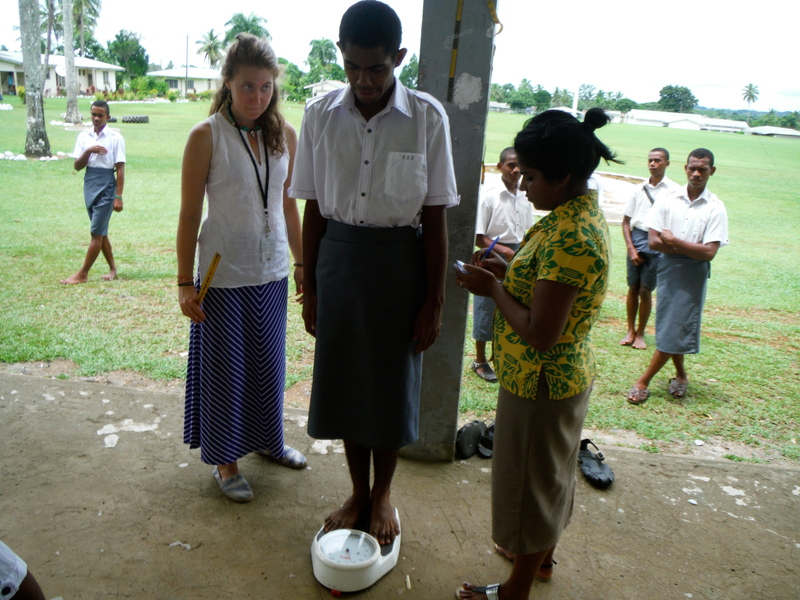 After graduating from college, I almost immediately joined the Peace Corps as a community health volunteer in Fiji. I felt certain that my anthropological training had adequately prepared me for my service in the South Pacific, where I was expected to learn the language, integrate into the community, and develop programs based off of local needs-assessments and desire. After spending my Pre-Service Training at a home stay in a remote, mountainous fishing village, I moved to my site in an equally remote town on the Eastern Coast of Viti Levu, one of the bigger islands the country consists of. Throughout my service, in an attempt to adapt to the culture and be accepted into my community, I found myself emptying out my identity to make space for a new “Fijian” version of myself. I struggled with how to translate my personality into my adopted social space, while simultaneously struggling with health issues from the moment of my arrival. Because of my anthropological training, and the ideologies that undergird Peace Corps, I took responsibility for any programmatic failures or difficulties I had connecting with my local partners. If I wasn’t able to befriend a neighbor, I felt that it was my fault—I wasn’t being sensitive or reflexive or open enough, there must be a flaw in my personality. I didn’t feel comfortable reaching out to members of the Peace Corps staff, for fear that my struggles would reflect poorly on me as a volunteer. Similarly, I was anxious to contact my anthropological mentors, afraid that my seeming challenges to connect with my Fijian counterparts meant that despite all my education and devotion to the discipline, I was not personally adept at cultural integration. This concern was perhaps the most devastating and depressing aspect of my service. When anthropologists actively avoid discussing the feelings of anxiety, depression and desperation associated with their fieldwork, they do a disservice to the next generation of aspiring anthropologists. Even though ethnography relies upon qualitative research methods, anthropologists inevitably enter their field site with certain expectations about the questions they want answered, the traditions they intend to explore, the in-depth interviews they hope to conduct. If, for any number of mitigating and complicating reasons and factors, you aren’t able to accomplish these goals, it precipitates yet another watershed of shame and regret that you simply weren’t good enough. Because anthropologists are participant observers, their bodies and identities are essentially the very tools of their practice. Therefore, personality clashes or the development of stress or fear under certain situations place the onus of culpability on the researcher. As an anthropologist, a “failure of fieldwork” is essentially conflated with a failure of yourself. In so doing, “A large number of students felt profound shame over their sense of failure in the field […] For some, going home early was a source of great shame” (Pollard 2009). When I left my Peace Corps service early, after months of illness and the impending signs of depression, it felt like I was abandoning the aspirations I had to become an anthropologist, despite the fact that the majority of my fellow volunteers were struggling with similar programmatic and personal issues. After spending so many years planning my trajectory toward becoming an anthropologist, this belief that my emotional struggles somehow disqualified me as an anthropologist only further tangled the crisis of identity I had undergone during my service. And I didn’t know how to talk about it because I felt completely alone. Upon returning to the United States, I was covered in scars from persistent skin infections and stress hives, my hair had fallen out, and my mood was ragged. I experienced many of the symptoms of depression, including sleeplessness and moodiness; sometimes interactions or objects would trigger uncontrollable feelings of sadness or anger. I had difficulty being around people and I walked everywhere draped in a cloak of self-loathing. For my friends and family members who haven’t traveled widely or spent long periods abroad, they couldn’t understand why I believed that my difficulties in Fiji were solely my fault. When I sought out therapists to talk through my lingering misgivings, they praised me for my strength and courage, when what I wanted was not to be coddled, but to understand why I hadn’t “worked” in my community, when it felt like I had spent all my energy trying to integrate. Many friends and acquaintances also did not want to hear that I hadn’t had a positive experience—in their minds, Fiji was nothing more than a tropical paradise and it seemed feckless to explain my humanitarian, existential misgivings about it. This was not reverse culture shock per se, yet I was at a loss about how to recuperate and heal, mentally as well as physically, let alone negotiate my anthropological path moving forward. I was simply afraid that I wasn’t cut out to do fieldwork. During this period of uncertainty, I turned to video games. In the past, I’ve also used video games as a coping mechanism. After suffering from a traumatic brain injury my freshman year, I suffered from sometimes crippling dissociation and self-doubt about my cognitive abilities. My neurologist was unhelpful, and the only option I was offered to heal was to sit and wait for my brain to stop bleeding. Brain injuries are unique in that they often invoke crises of identity. With so much forthcoming research on the connection between the frontal lobe and personality, I experienced an acute crisis of self after my brain contusion. Offered with no other recourse or resilience methods, video games helped coax me back to a space of equilibrium. In both cases, playing video games provided a viable alternative to being social. If I felt disconnected from the world around me, or anxious about having to explain why I had come home early, I could retreat to RPG’s. Video games can put you in touch with a wide online community, thereby facilitating social contact for those who might otherwise feel stress or anxiety at the prospect of socializing with strangers. For me, I felt powerless to help myself—video games were an active way to use my time and process my emotions. Rather than passively consuming other forms of media, such as movies or television shows, video games provide you with tangible goals, objectives that, when achieved, provide players with a sense of success and achievement. As Romeo Vitelli wrote for Psychology Today, “By setting specific tasks and allowing young people to work through obstacles to achieve those tasks, video games can help boost self-esteem and help children learn the value of persistence. By providing immediate feedback as video game players solve problems and achieve greater expertise, players can learn to see themselves as having skills and intelligence they might not otherwise realize they possess” (2014). During a period of such acute self-doubt, it was extremely satisfying to be posed with challenges and obstacles that at first seemed insurmountable, but that could be accomplished through patience, creativity and skill-building. Video games became a refuge for my cultural concerns as well. 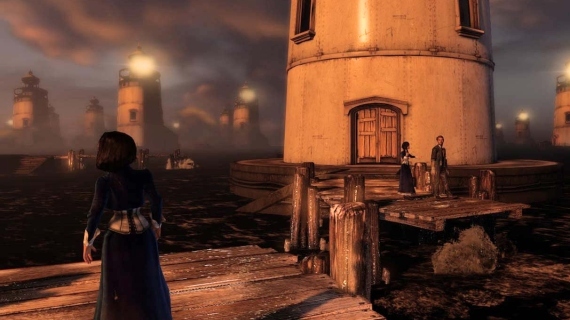 Games like BioShock: Infinite (2013) and Dishonored (2012) were dystopian alternatives to human history, new life worlds I could explore and inhabit through a sense of play and constant discovery. I was particularly drawn to games with robust storytelling mechanics, where the developers and programmers had clearly invested a lot of time and attention to the minutia of the world, encouraging players to interact with minor characters, read books and notes scattered around the stages, and learn about the internal mythologies, politics and social dynamics that informed the action of the game. I no longer felt powerless, but had a degree of agency to determine the kind of player I wanted to be. In Dishonored, like other games such as Infamous (2009), your actions as a player determine the internal stability of the virtual play space. Even though I had spent months working on community health empowerment, with few visible signs that my efforts were making any difference, I could immediately see how acts of benevolence positively impacted the city of Dunwall. In recent games, many of the avatars that players inhabit are also saddled with their own traumatic experiences which are explored throughout the game. Booker DeWitt of Bioshock: Infinite has a dark past, and other characters, like Bruce Wayne’s Batman throughout Arkham Asylum, City and Origins, are constantly battling their own demons, whether invented or embodied as supervillains. To a certain extent, I was able to project my internal monsters onto the villains in the games, channeling my anger and frustration in a way that felt both productive and cathartic. I could go to bed at night feeling as though I had accomplished something, and had something in the morning I could look forward to. In the absence of other motivations, and paralyzed by fear about the future, this sense of purpose saved me. New literature has begun to indicate the salutary psychological effects of video games. Studiessuggest that video games may have beneficial effects on cognition, motivation, emotion and sociality; some psychologists have even begun to recommend video games as a form of therapyfor patients with mental health issues, including depression. Contemporaneously, programmers and developers are working on video games as tools to cope with mental health issues. Zoe Quinn’s Depression Quest (made famous due to its involvement in the #Gamergate controversy) was created to explore what life was like living with depression; other forms of e-literature build interactive stories around the expression of grief and mourning. Whereas several years ago, critics and concerned parents worried that video games like Grand Theft Auto were producing violent, unempathetic adolescents, practitioners are beginning to understand that the process of play may actually serve a positive psychological function. On a related note, The Mary Sue recently published “Coping With Anxiety and Depression Through Fiction” (2015), a poignant piece outlining the ways in which Guardians of the Galaxy’s character development and musical composition helped the writer overcome anxiety attacks and obtain a sense of emotional stability. Marie-Pierre wrote about rewatching episodes of Star Trek to maintain her equilibrium during fieldwork and Peter Olthoff remarked on the therapeutic efficacy of geek culture. Whether it’s a space opera, a society ravaged by an infection of zombies, or a fantastical universe populated by dragons, elves and other mythological beings, video games help transport you to another world, not necessarily as a form of escapism, but rather as a creative space to process your own lived reality. As it turned out, the rediscovery of video games upon my return led me back to anthropology. I read about ground-breaking games like The Last of Us (2013) and its place within the larger resurgence in zombie-lore. Through my research, I discovered the work of Louise Krasniewicz, a UPenn Anthropology professor who built a class around The Walking Dead. I was lucky enough to sit down for coffee with Dr. Krasniewicz to discuss her approach to geek anthropology, but after running through our recent favorite shows and theories about monstrosity, we inevitably turned to the topic of fieldwork. Emboldened by our conversation, I opened up to her about my experience in Fiji, my doubts as an anthropologist, and my misgivings about the negative consequences of prolonged sojourns in new cultural territory. Expecting reproach or judgement, my story was instead met by a laugh from her. “Welcome to your first time doing fieldwork! It’s horrible for everyone!” she replied. She then went on to recount her own experience conducting fieldwork in upstate New York—hardly the “exotic” destination one would expect for an Ivy League professor—and how difficult the process was emotionally. Even within her native country, where she spoke the language and shared similar cultural assumptions, she struggled to find a community and sense of connection with her interlocutors. Yet, despite her ethnographic challenges, she went on to become a successful anthropology professor. She did not interpret the issues with immersion as her failure as a practitioner, as I had during my experience in Fiji. While many anthropologists have written about the role of emotion during ethnography, such as James Davies and Dimitrina Spencer’s book Emotions in the Field: The Psychology and Anthropology of Fieldwork Experience (2010), and phenomenological anthropologists encourage attention to the ways we physically and emotionally react to our surroundings, I don’t believe that there has been enough discussion about the emotional labor of fieldwork, both to prepare students and acknowledge that the anthropologist is not wholly culpable for “failure” in the field. 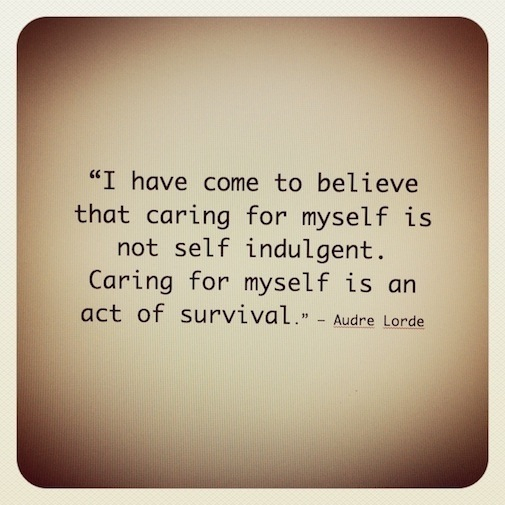 In professional fields that deal with emotionally draining issues, such as gender-based violence, there is a heavy emphasis on self-care for activists. An advocate may experience vicarious trauma if they work with survivors of sexual violence day after day, sometimes leading to emotional fatigue and burn-out. For humanitarian researchers conducting interviews with refugees, internally displaced populations, or war-torn communities still reeling from horrific acts of violence, program managers ensure that the interviewers have sufficient support and counselling mechanisms to decompress and work through the emotional labor of their work. The same practices can and should be applied to anthropology. Indeed, as Amy Pollard points out, “Students reported finding it difficult to let go of the traumas of fieldwork, because the writing-up process meant they were continually having to relive them” (2009); their recuperation process may be only further stymied by the culture of silence that pervades discussions about what occurs in the field. Students of anthropology recognize and perhaps relish in the hardships they will encounter during ethnographic research, but if they are given no inkling of the possibility that they won’t always jive with their chosen community or culture, they will have no coping mechanisms or strategies for resilience. Larissa Begley writes of her experience in Rwanda, “As anthropologists, we are part of the narrative we create. Our fieldwork does not exist detached from our own emotions and our lives. We impact on those we study and they impact on us. It is because of this dialectical relationship we have with the ‘field’ that we must recognize the impact that fieldwork can have emotionally, psychologically and physically on us” (2009). Just because we are academically prepared to live in a different culture, doesn’t mean we have the emotional methodologies to succeed. How do you translate your personality into a new cultural space while also being sensitive and flexible? Rachel Irwin writes that, “Depression, in the form of culture shock, occurs when the firm grounding in one’s own symbolic world is lost” (2007)—this symbolic world and one’s own identity is thrown into flux when you enter and attempt to become a part of a new cultural space. There are bound to be growing pains and types of people you don’t always get along with. I realize now that I didn’t have to suppress my identity in the process of incorporating into Fijian culture. I wish I had read Jessika Tremblay’s post on “10 Tips For Surviving Anthropological Fieldwork” before my service, especially her recommendations on not taking things so personally and “harnessing the power of your introversion” (2014). I know that there were nights in Fiji I retreated to my house to decompress and write, but felt guilty if I was skipping one of the nightly kava sessions held on my compound. If anthropology is to continue to grow as a discipline, we need to ensure that students are prepared for fieldwork, equipped to be both emotionally vulnerable while mentally sustainable. A vital part of self-care is an institutional support system, one that the anthropological community can strive to cultivate. If we are concerned with cross-cultural psychiatry, we should be equally in tune with the mental health of our comrades. You can never predict how fieldwork will change you, and it’s important to maintain a disposition of self-reflexivity, yet the process of discovery should not necessarily come at the cost of self. We need to turn, yet again, within our own community to analyze our professional and personal predispositions, and clarify how we can support one another through the process. BioShock Infinite (2013). Irrational Games. Davies, James & Dimitrina Spencer (2010). Emotions in the Field: The Psychology and Anthropology of Fieldwork Experience . Stanford University Press. Infamous (2009). Sucker Punch Productions. The Last of Us (2013). Naughty Dog. David G. Victor calls for the IPCC process to be extended to include insights into controversial social and behavioural issues. The Intergovernmental Panel on Climate Change (IPCC) is becoming irrelevant to climate policy. 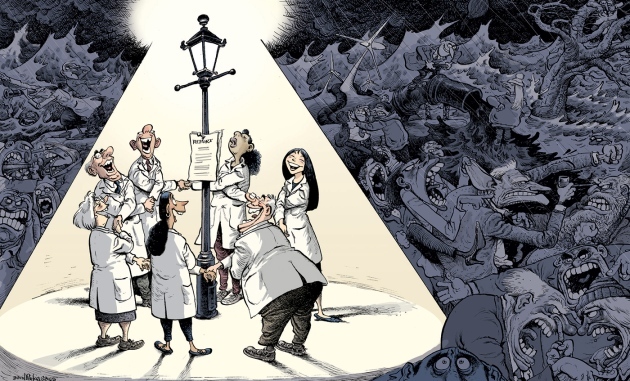 By seeking consensus and avoiding controversy, the organization is suffering from the streetlight effect — focusing ever more attention on a well-lit pool of the brightest climate science. But the insights that matter are out in the darkness, far from the places that the natural sciences alone can illuminate. With the ink barely dry on the IPCC’s latest reports, scientists and governments are planning reforms for the next big assessment1, 2. Streamlining the review and writing processes could, indeed, make the IPCC more nimble and relevant. But decisions made at February’s IPCC meeting in Nairobi showed that governments have little appetite for change. The basic report-making process and timing will remain intact. Minor adjustments such as greater coverage of cross-cutting topics and more administration may make the IPCC slower. Similar soul searching, disagreement, indecision and trivial procedural tweaks have followed each of the five IPCC assessments over the past 25 years3. This time needs to be different. The IPCC must overhaul how it engages with the social sciences in particular (see go.nature.com/vp7zgm). Fields such as sociology, political science and anthropology are central to understanding how people and societies comprehend and respond to environmental changes, and are pivotal in making effective policies to cut emissions and collaborate across the globe. The IPCC has engaged only a narrow slice of social-sciences disciplines. Just one branch — economics — has had a major voice in the assessment process. In Working Group III, which assesses climate-change mitigation and policy, nearly two-thirds of 35 coordinating lead authors hailed from the field, and from resource economics in particular. 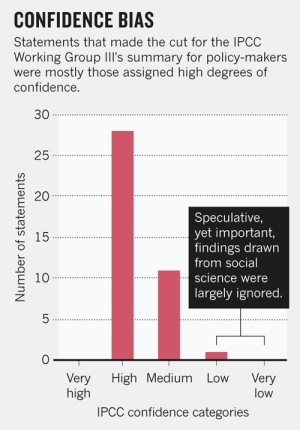 The other social sciences were mostly absent. There was one political scientist: me. Among the few bright spots in that report compared with earlier ones is greater coverage of behavioural economics and risk analysis. In Working Group II, which assesses impacts and adaptation, less than one-third of the 64 coordinating lead authors were social scientists, and about half of those were economists. Bringing the broader social sciences into the IPCC will be difficult, but it is achievable with a strategy that reflects how the fields are organized and which policy-relevant questions these disciplines know well. It will require big reforms in the IPCC, and the panel will have to relinquish part of the assessment process to other organizations that are less prone to paralysis in the face of controversy. The IPCC walks a wavering line between science, which requires independence, and diplomacy, which demands responsiveness to government preference. Although scientists supply and hone the material for reports, governments have a say in all stages of assessment: they adopt the outline for each chapter, review drafts and approve the final reports. Such tight oversight creates incentives for scientists to stick to the agreed scope and strip out controversial topics. These pressures are especially acute in the social sciences because governments want to control statements about social behaviour, which implicate policy. This domain covers questions such as which countries will bear the costs of climate change; schemes for allocating the burden of cutting emissions; the design of international agreements; how voters respond to information about climate policy; and whether countries will go to war over climate-related stress. The social sciences can help to provide answers to these questions, key for effective climate policy. In practice, few of these insights are explored much by the IPCC. The narrowness of what governments will allow the IPCC to publish is particularly evident in the summary for policy-makers produced at the end of each assessment. Governments approve this document line-by-line with consensus. Disagreements range from those over how to phrase concepts such as a ‘global commons’ that requires collective action to those about whole graphs, which might present data in ways that some governments find inconvenient. For example, during the approval of the summary from Working Group III last April, a small group of nations vetoed graphs that showed countries’ emissions grouped according to economic growth. Although this format is good science — economic growth is the main driver of emissions — it is politically toxic because it could imply that some countries that are developing rapidly need to do more to control emissions4. The big problem with the IPCC’s output is not the widely levelled charge that it has become too policy prescriptive or is captivated by special interests5. Its main affliction is pabulum — a surfeit of bland statements that have no practical value for policy. Abstract, global numbers from stylized, replicable models get approved because they do not implicate any country or action. Insights such as which policies work (or fail) in practice are skirted. Caveats are buried or mangled. Readers of the Working Group III summary for policy-makers might learn, for instance, that annual economic growth might decrease by just 0.06 percentage points by 2050 if governments were to adopt policies that cut emissions in line with the widely discussed goal of 2 °C above pre-industrial levels6. They would have to wade through dense tables to realize that only a fraction of the models say that the goal is achievable, and through the main report to learn that the small cost arises only under simplified assumptions that are far from messy reality. That said, the social sciences are equally culpable. Because societies are complex and are in many ways harder to study than cells in a petri dish, the intellectual paradigms across most of the social sciences are weak. Beyond a few exceptions — such as mainstream economics — the major debates in social science are between paradigms rather than within them. Consider the role of international law. Some social scientists treat law like a contract; others believe that it works mainly through social pressures. The first set would advise policy-makers to word climate deals precisely — to include targets and timetables for emissions cuts — and to apply mechanisms to ensure that countries honour their agreements. The second group would favour bold legal norms with clear focal points — striving for zero net emissions, for example7. Each approach could be useful in the right context. Multiple competing paradigms make it hard to organize social-science knowledge or to determine which questions and methods are legitimate. Moreover, the incentives within the social sciences discourage focusing on particular substantive topics such as climate change — especially when they require interdisciplinary collaboration. In political science, for example, research on political mobilization, administrative control and international cooperation among other specialities are relevant. Yet no leading political-science department has a tenured professor who works mainly on climate change8. The paradigm problem need not be paralysing. Social scientists should articulate why different intellectual perspectives and contexts lead to different conclusions. Leading researchers in each area can map out disagreement points and their relevance. Climate scientists and policy-makers should talk more about how disputes are rooted in different values and assumptions — such as about whether government institutions are capable of directing mitigation. Such disputes help to explain why there are so many disagreements in climate policy, even in areas in which the facts seem clear9. Unfortunately, the current IPCC report structure discourages that kind of candour about assumptions, values and paradigms. It focuses on known knowns and known unknowns rather than on deeper and wider uncertainties. The bias is revealed in how the organization uses official language to describe findings — half of the statements in the Working Group III summary were given a ‘high confidence’ rating (see ‘Confidence bias’). Building the social sciences into the IPCC and the climate-change debate more generally is feasible over the next assessment cycle, which starts in October and runs to 2022, with efforts on the following three fronts. First, the IPCC must ask questions that social scientists can answer. If the panel looks to the social-sciences literature on climate change, it will find little. But if it engages the fields on their own terms it will find a wealth of relevant knowledge — for example, about how societies organize, how individuals and groups perceive threats and respond to catastrophic stresses, and how collective action works best. 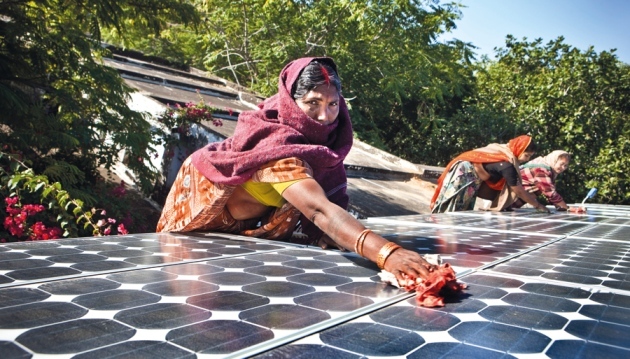 The solar-powered Barefoot College in Rajasthan, India, trains rural villagers in how to install, build and repair solar technologies. As soon as the new IPCC leadership is chosen later this year, the team should invite major social-sciences societies such as the American Political Science Association, the American and European societies of international law, the American Sociological Association and the Society for Risk Analysis to propose relevant topics that they can assess and questions they can answer. Multidisciplinary scientific organizations in diverse countries — such as the Royal Society in London and the Third World Academy of Sciences — would round out the picture, because social-sciences societies tend to be national and heavily US-based. These questions should guide how the IPCC scopes its next reports. The agency should also ask such societies to organize what they know about climate by discipline — how sociology examines issues related to the topic, for example — and feed that into the assessment. Second, the IPCC must become a more attractive place for social-science and humanities scholars who are not usually involved in the climate field and might find IPCC involvement daunting. The IPCC process is dominated by insiders who move from assessment to assessment and are tolerant of the crushing rounds of review and layers of oversight that consume hundreds of hours and require travel to the corners of the globe. Practically nothing else in science service has such a high ratio of input to output. The IPCC must use volunteers’ time more efficiently. Third, all parties must recognize that a consensus process cannot handle controversial topics such as how best to design international agreements or how to govern the use of geoengineering technologies. For these, a parallel process will be needed to address the most controversial policy-relevant questions. This supporting process should begin with a small list of the most important questions that the IPCC cannot handle on its own. A network of science academies or foundations sympathetic to the UN’s mission could organize short reports — drawing from IPCC assessments and other literature — and manage a review process that is truly independent of government meddling. Oversight from prominent social scientists, including those drawn from the IPCC process, could give the effort credibility as well as the right links to the IPCC itself. The list of topics to cover in this parallel mechanism includes how to group countries in international agreements — beyond the crude kettling adopted in 1992 that split the world into industrialized nations and the rest. The list also includes which kinds of policies have had the biggest impact on emissions, and how different concepts of justice and ethics could guide new international agreements that balance the burdens of mitigation and adaptation. There will also need to be a sober re-assessment of policy goals when it becomes clear that stopping warming at 2 °C is no longer feasible10. The IPCC has proved to be important — it is the most legitimate body that assesses the climate-related sciences. But it is too narrow and must not monopolize climate assessment. Helping the organization to reform itself while moving contentious work into other forums is long overdue. IPCC. Future Work of the IPCC: Chairman’s Vision Paper on the Future of the IPCC (IPCC, 2015). IPCC. Future Work of the IPCC: Consideration of the Recommendations by the Task Group on Future Work of the IPCC (IPCC, 2015). Committee to Review the Intergovernmental Panel on Climate Change. Climate Change Assessments: Review of the Processes and Procedures of the IPCC (InterAcademy Council, 2010). Victor, D. G., Gerlagh, R. & Baiocchi, G. Science 345, 34–36 (2014). Hulme, M. et al. Nature 463, 730–732 (2010). IPCC. Summary for Policymakers in Climate Change 2014: Mitigation of Climate Change. Contribution of Working Group III to the Fifth Assessment Report of the Intergovernmental Panel on Climate Change (eds Edenhofer, O. et al.) (Cambridge Univ. Press, 2014). Hafner-Burton, E. M., Victor, D. G. & Lupu, Y. Am. J. Intl Law 106, 47–97 (2012). Keohane, R. O. PS: Political Sci. & Politics 48, 19–26 (2015). Hulme, M. Why We Disagree About Climate Change: Understanding Controversy, Inaction and Opportunity (Cambridge Univ. Press, 2009). Victor, D. G. & Kennel C. F. Nature 514, 30–31 (2014). How stakeholders communicate about climate change has long been framed by who’s doing the framing as much, or more so, than the information being communicated. So I am forever curious how various stakeholders — believers, skeptics and deniers alike — are talking about it and who, if anybody, is “moving the needle” in either direction. One of the most salient and recent inputs to the climate communications conundrum is Don’t Even Think About It — Why Our Brains Are Wired To Ignore Climate Change, by George Marshall in Oxford, England. Marshall’s work deserves to be spotlighted for how it illuminates why skeptics and deniers alike will not be moved to engage in thoughtful exchanges unless those communicating respect certain tenets of what academic and nonprofit research are finding. Marshall draws on the efforts of the climate information network (COIN) he co-founded along with research by two leading university-based centers: the Project on Climate Change Communications at Yale University in Princeton, NJ and the Center for Climate Change Communications at George Mason University in Fairfax, VA.
George Marshall is the co-founder of the Climate Outreach and Information Network, a nonprofit organization that specializes in public communication around climate change. Marshall also taps into the works of authorities who’ve written and/or spoken extensively about climate change, such as Harvard Professor of Psychology Daniel Gilbert, GOP pollster Frank Luntz, Princeton Psychology and Public Affairs Professor Daniel Kahneman, former South Carolina Congressman Bob Inglis, Associate Professor of Sociology at University of Oregon Kari Norgaard and ABC-TV network correspondent Bill Blakemore. Perhaps it would behoove those preparing for the upcoming United Nations Climate Change Conference of the Parties, aka COP21, in Paris November 30 – December 11, 2015 to heed much of what Marshall and other top-tier researchers are finding and sharing if they are serious about forging a legally binding and universal agreement on climate. Here is my synthesis of the most illuminating take-a-ways from Marshall’s book. I offer it as a checklist with which to gauge climate communications efforts, regardless of which — if any — side of the issue you’re on. Be sure to share your thoughts. Perceptions are shaped by individual psychological coping mechanisms and the collective narratives that they shape with the people around them. A compelling emotional story that speaks to peoples’ core values has more impact than rational scientific data such as hotter global temperatures and rising sea levels. People’s social identity has an extraordinary hold over their behaviors and views. Drawing too much attention to an undesirable norm (e.g. catastrophic weather) can seriously backfire. In high-carbon societies, EVERYone has a strong reason to ignore the problem or to write their own alibi. What might work better are narratives based on cooperation, mutual interests and a common humanity. The real story is about our fear, denial and struggle to accept our own responsibility. “Climate change isn’t the elephant in the room; it’s the elephant we’re all inside of,” said ABC’s Bill Blakemore. Our brains are UNsuited to deal with climate change unless the threats are personal, abrupt, immoral and immediate. A distant, abstract and disputed threat does not have the necessary characteristics for seriously mobilizing public opinion. Without a clear deadline for action, we create our own timeline. We do so in ways that remove the compulsion to act. We make it just current enough to accept that something needs to be done but put it just too far into the future to require immediate action. We’d all benefit the most from: what models for communicating about climate change are working, and which ones are not? The messenger is more important than the message. The messenger can be the most important — but also the weakest link — between scientific information and personal conviction. Building on that, to break the partisan “deadlock” and public disinterest starts, Marshall asserts educational efforts need to create the means for new messengers to be heard. There may be lessons learned from the campaign by oil giant BP in the early 2000s offering person-on-the-street testimonials about the need to deal with climate change. Full disclosure: While a Senior Vice President of Public Affairs with Ogilvy Public Relations Worldwide from 2001-2006, I helped develop and execute elements of BP’s “Beyond Petroleum” campaign. Until the economy is back on a strong growth track, climate change advocates will struggle to earn attention in their home countries as long as bread-and-butter ‘pocketbook’ issues are more important to an overwhelming majority of citizens. See George Marshall in action from this recent interview on TalkingStickTV via YouTube. While we’re on the subject, I recommend reading the excellent work by the MacArthur Foundation’s “Connecting on Climate” guide completed in 2014. It includes 10 principles for effective climate change communication based on research from various social science fields. O volume de chuvas no início de fevereiro, que já se aproxima da média para o mês, levou o governo Geraldo Alckmin (PSDB) a adiar a decisão sobre a implantação de um rodízio de água na Grande SP. Nas palavras de um assessor do governo, “a Sabesp não jogou a toalha” e, diante de um cenário com chuvas até o final de março e o avanço simultâneo de algumas obras, será até mesmo possível atravessar o período de seca, de maio a setembro, sem rodízio. 3) A capacidade de interligação entre sistemas terá de ser ampliada. Dessa forma, águas do Guarapiranga e do Alto Tietê, por exemplo, poderão atender moradores hoje abastecidos pelo Cantareira em áreas de Guarulhos, na Vila Maria (zona norte), Mooca (zona leste) e Brás (centro). 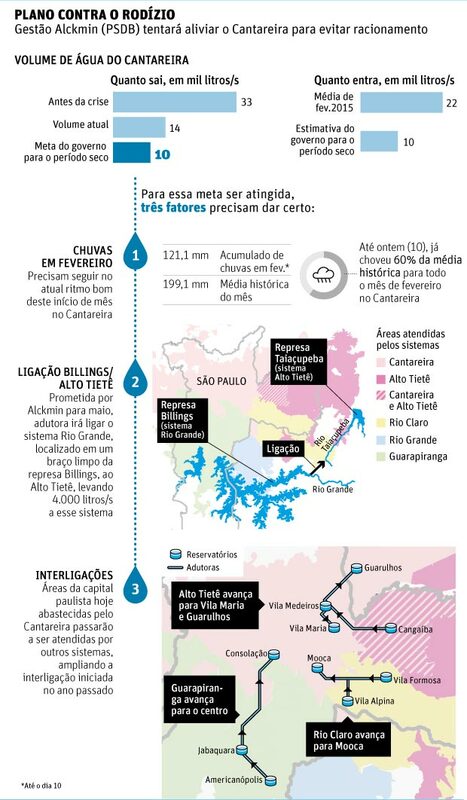 Com tudo isso, aliado principalmente à política de racionamento por meio da redução da pressão na rede de abastecimento, a Sabesp acredita que poderá manter uma vazão de no mínimo 10 mil litros de água por segundo no Cantareira ao longo de 2015, o suficiente, segundo a estatal, para evitar o início do rodízio –a vazão atual é de 14 mil l/seg. Qualquer falha em um desses três pontos, porém, provocará a reavaliação desse planejamento. O final de fevereiro, por ora, é o prazo tratado internamente como limite para definir o rodízio. Questionado ontem (10/02) sobre o tema, Alckmin afirmou que não existe nada definido. “É uma decisão técnica, da Sabesp, que faz o monitoramento diário”. Até o final de janeiro, quando o volume de chuvas seguia bem abaixo da média histórica e o Cantareira caminhava para um colapso completo, o governo paulista tratava o rodízio apenas como uma questão de tempo. Foi nesse contexto, por exemplo, que um dirigente da Sabesp falou na possibilidade de um rodízio “pesado”, com cinco dias sem água e apenas dois com na semana. As chuvas de fevereiro não tiraram o Cantareira de uma situação crítica, mas deram uma leve trégua ao governo. O sistema operou nesta terça (10) com 6,1% de sua capacidade, após mais uma alta. Esse percentual já inclui duas cotas do volume morto, que são as reservas de água abaixo do nível original de captação. Para evitar um rodízio em 2015, o governo espera que o sistema chegue ao final de março entre 10% e 12% –com o solo úmido após as recentes chuvas, foram reduzidos os danos do chamado “efeito esponja”, que impede o armazenamento da água da chuva. A gigantic mushroom cloud billowed over Nagasaki, Japan, when an atomic bomb was dropped on the city in 1945. The world is “3 minutes” from doomsday. That’s the grim outlook from board members of The Bulletin of the Atomic Scientists. Frustrated with a lack of international action to address climate change and shrink nuclear arsenals, they decided today (Jan. 22) to push the minute hand of their iconic “Doomsday Clock” to 11:57 p.m. The Bulletin of the Atomic Scientists doesn’t use the clock to make any real doomsday predictions. Rather, the clock is a visual metaphor to warn the public about how close the world is to a potentially civilization-ending catastrophe. Each year, the magazine’s board analyzes threats to humanity’s survival to decide where the Doomsday Clock’s hands should be set. Experts on the board said they felt a sense of urgency this year because of the world’s ongoing addiction to fossil fuels, procrastination with enacting laws to cut greenhouse gas emissions and slow efforts to get rid of nuclear weapons. For instance, if nothing is done to reduce the amount of heat-trapping gasses, such as carbon dioxide, in the atmosphere, Earth could be 5 to 15 degrees Fahrenheit (3 to 8 degrees Celsius) warmer by the end of century, said Sivan Kartha, a senior scientist at the Stockholm Environment Institute. Some people might not feel alarmed when they see those numbers; they might normally experience that kind of temperature swing in the course of a single day, Kartha said. But, he said a temperature increase of that magnitude was enough to bring the world out of the last ice age, and it will be enough to “radically transform” the Earth’s surface in the future. Sharon Squassoni, another board member and director of the Proliferation Prevention Program at the Center for Strategic and International Studies, said nuclear disarmament efforts have “ground to a halt” and many nations are expanding, not scaling back, their nuclear capabilities. Russia is upgrading its nuclear program, India plans to expand its nuclear submarine fleet, and Pakistan has reportedly started operating a third plutonium reactor, Squassoni said. “The risk from nuclear weapons is not that someone is going to press the button, but the existence of these weapons costs a lot of time, effort and money to keep them secure,” Squassoni said, adding that there have been troubling safety discrepancies reported in recent years at power plants. The Bulletin of the Atomic Scientists was founded in 1945 by scientists who created the atomic bomb as part of the Manhattan Project and wanted to raise awareness about the dangers of nuclear technology. The Doomsday Clock first appeared on a cover of the magazine in 1947, with its hands set at 11:53 p.m. The clock’s hands shifted quite a bit over the following seven decades. They were closest to midnight in 1953, set at 11:58 p.m., after both the United States and the Soviet Union conducted their first tests of the hydrogen bomb. The clock’s hands were pushed all the way back to 11:43 p.m., 17 minutes to midnight, in December 1991, after the world’s superpowers signed the Strategic Arms Reduction Treaty, which at the time, seemed like a promising move toward nuclear disarmament. Summary: New research finds that cultures living in harsher ecosystems with limited resources are more prone to a belief in moralizing, high gods. The results indicate that other cross-disciplinary factors, including as political complexity, also influence this belief. Just as physical adaptations help populations prosper in inhospitable habitats, belief in moralizing, high gods might be similarly advantageous for human cultures in poorer environments. A new study from the National Evolutionary Synthesis Center (NESCent) suggests that societies with less access to food and water are more likely to believe in these types of deities. Gray and his coauthors found a strong correlation between belief in high gods who enforce a moral code and other societal characteristics. 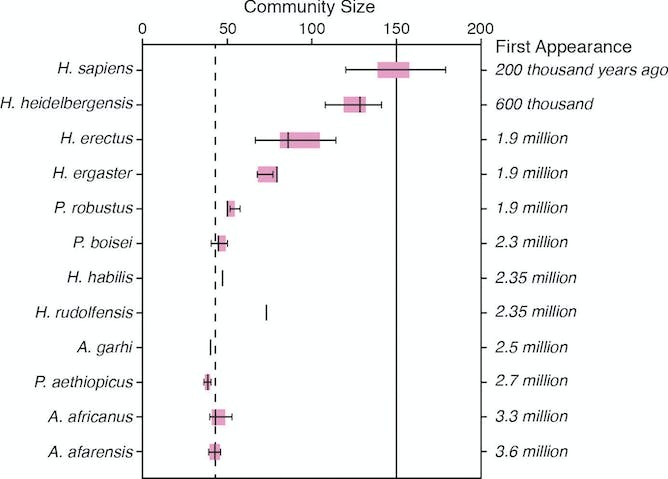 Political complexity–namely a social hierarchy beyond the local community– and the practice of animal husbandry were both strongly associated with a belief in moralizing gods. The emergence of religion has long been explained as a result of either culture or environmental factors but not both. The new findings imply that complex practices and characteristics thought to be exclusive to humans arise from a medley of ecological, historical, and cultural variables. The paper, which is now available online, will be published in an upcoming issue of the Proceedings of the National Academies of Science. To study variables associated with the environment, history, and culture, the research team included experts in biology, ecology, linguistics, anthropology, and even religious studies. The senior author, Gray, studies the intersection of psychology and linguistics, while Botero, an evolutionary ecologist, has examined coordinated behaviors in birds. This study began with a NESCent working group that explored the evolution of human cultures. On a whim, Botero plotted ethnographic data of societies that believe in moralizing, high gods and found that their global distribution is quite similar to a map of cooperative breeding in birds. The parallels between the two suggested that ecological factors must play a part. Furthermore, recent research has supported a connection between a belief in moralizing gods and group cooperation. However, prior to this study, evidence supporting a relationship between such beliefs and the environment was elusive. “A lot of evolutionists have been busy trying to bang religion on the head. I think the challenge is to explain it,” Gray says. Botero, Gray, and their coauthors used historical, social, and ecological data for 583 societies to illustrate the multifaceted relationship between belief in moralizing, high gods and external variables. Whereas previous research relied on rough estimates of ecological conditions, this study used high-resolution global datasets for variables like plant growth, precipitation, and temperature. The team also mined the Ethnographic Atlas– an electronic database of more than a thousand societies from the 20th century– for geographic coordinates and sociological data including the presence of religious beliefs, agriculture, and animal husbandry. Botero believes that this study is just the tip of the iceberg in examining human behavior from a cross-disciplinary standpoint. The team plans to further this study by exploring the processes that have influenced the evolution of other human behaviors including taboos, circumcision, and the modification of natural habitats. Em “Reasons and Persons”, uma das mais inovadoras obras de filosofia analítica dos últimos 30 anos, o filósofo Derek Parfit propõe um intrigante “experimento mental”. A situação descrita é hipotética, mas ajuda a explicitar um ponto nevrálgico do maior desafio humano: limitar o aquecimento global a 2°C acima do nível pré-industrial até o final do século 21. Imagine uma pessoa afivelada a uma cama com eletrodos colados em suas têmporas. Ao se girar um botão situado em outro local a corrente nos eletrodos aumenta em grau infinitesimal, de modo que o paciente não chegue a sentir. Um Big Mac gratuito é então ofertado a quem girar o botão. Ocorre, contudo, que quando milhares de pessoas fazem isso –sem que cada uma saiba dos outros– a descarga de energia produzida é suficiente para eletrocutar a vítima. Quem é responsável pelo que? Algo tenebroso foi perpetrado, mas a quem atribuir a culpa? O efeito isolado de cada giro do botão é por definição imperceptível –são todos “torturadores inofensivos”. Mas o resultado conjunto dessa miríade de ações é ofensivo ao extremo. Até que ponto a somatória de ínfimas partículas de culpa se acumula numa gigantesca dívida moral coletiva? A mudança climática em curso equivale a uma espécie de eletrocussão da biosfera. Quem a deseja? Até onde sei, ninguém. Trata-se da alquimia perversa de inumeráveis atos humanos, cada um deles isoladamente ínfimo, mas que não resulta de nenhuma intenção humana. E quem assume –ou deveria assumir– a culpa por ela? A maioria e ninguém, ainda que alguns sejam mais culpados que outros. Os 7 bilhões de habitantes do planeta pertencem a três grupos: cerca de 1 bilhão respondem por 50% das emissões totais de gases-estufa, ao passo que os 3 bilhões seguintes por 45%. Os 3 bilhões na base da pirâmide de energia (metade sem acesso a eletricidade) respondem por apenas 5%. Por seu modo de vida e vulnerabilidade, este grupo –o único inocente– será o mais tragicamente afetado pelo “giro de botão” dos demais. Descarbonizar é preciso. Segundo o recém-publicado relatório do painel do clima da ONU, limitar o aquecimento a 2°C exigirá cortar as emissões antropogênicas de 40% a 70% em relação a 2010 até 2050 e zerá-las até o final do século. Como chegar lá? A complexidade do desafio é esmagadora. Contar com a gradual conscientização dos “torturadores inocentes” parece irrealista. Pagar para ver e apostar na tecnologia como tábua de salvação seria temerário ao extremo. O protagonista da ação, creio eu, deveria ser a estrutura de incentivos: precificar o carbono e colocar a força do sistema de preços para trabalhar no âmbito da descarbonização. EDUARDO GIANNETTI escreve às sextas-feiras nesta coluna. DURHAM, N.C. — There may be a scientific answer for why conservatives and liberals disagree so vehemently over the existence of issues like climate change and specific types of crime. A new study from Duke University finds that people will evaluate scientific evidence based on whether they view its policy implications as politically desirable. If they don’t, then they tend to deny the problem even exists. The study, “Solution Aversion: On the Relation Between Ideology and Motivated Disbelief,” appears in the November issue of the Journal of Personality and Social Psychology (viewable athttp://psycnet.apa.org/journals/psp/107/5/809/). The researchers conducted three experiments (with samples ranging from 120 to 188 participants) on three different issues — climate change, air pollution that harms lungs, and crime. “The goal was to test, in a scientifically controlled manner, the question: Does the desirability of a solution affect beliefs in the existence of the associated problem? In other words, does what we call ‘solution aversion’ exist?” Campbell said. For climate change, the researchers conducted an experiment to examine why more Republicans than Democrats seem to deny its existence, despite strong scientific evidence that supports it. One explanation, they found, may have more to do with conservatives’ general opposition to the most popular solution — increasing government regulation — than with any difference in fear of the climate change problem itself, as some have proposed. Participants in the experiment, including both self-identified Republicans and Democrats, read a statement asserting that global temperatures will rise 3.2 degrees in the 21st century. They were then asked to evaluate a proposed policy solution to address the warming. When the policy solution emphasized a tax on carbon emissions or some other form of government regulation, which is generally opposed by Republican ideology, only 22 percent of Republicans said they believed the temperatures would rise at least as much as indicated by the scientific statement they read. But when the proposed policy solution emphasized the free market, such as with innovative green technology, 55 percent of Republicans agreed with the scientific statement. For Democrats, the same experiment recorded no difference in their belief, regardless of the proposed solution to climate change. The researchers found liberal-leaning individuals exhibited a similar aversion to solutions they viewed as politically undesirable in an experiment involving violent home break-ins. When the proposed solution called for looser versus tighter gun-control laws, those with more liberal gun-control ideologies were more likely to downplay the frequency of violent home break-ins. Campbell added that solution aversion can help explain why political divides become so divisive and intractable. The researchers noted there are additional factors that can influence how people see the policy implications of science. Additional research using larger samples and more specific methods would provide an even clearer picture, they said. The study was funded by The Fuqua School of Business. Summary: Our mood can affect how we walk — slump-shouldered if we’re sad, bouncing along if we’re happy. Now researchers have shown it works the other way too — making people imitate a happy or sad way of walking actually affects their mood. Subjects who were prompted to walk in a more depressed style, with less arm movement and their shoulders rolled forward, experienced worse moods than those who were induced to walk in a happier style, according to the study published in theJournal of Behavior Therapy and Experimental Psychiatry. Summary: Dogs generally seem to be cheerful, happy-go-lucky characters, so you might expect that most would have an optimistic outlook on life. In fact some dogs are distinctly more pessimistic than others, new research shows. “This research is exciting because it measures positive and negative emotional states in dogs objectively and non-invasively. It offers researchers and dog owners an insight into the outlook of dogs and how that changes,” said Dr Melissa Starling, from the Faculty of Veterinary Science. Her PhD research findings are published in PLOS One today. Dogs were taught to associate two different sounds (two octaves apart) with whether they would get the preferred reward of milk or instead get the same amount of water. Once the dogs have learnt the discrimination task, they are presented with ‘ambiguous’ tones. If dogs respond after ambiguous tones, it shows that they expect good things will happen to them, and they are called optimistic. They can show how optimistic they are by which tones they respond to. A very optimistic dog may even respond to tones that sound more like those played before water is offered. “Of the dogs we tested we found more were optimistic than pessimistic but it is too early to say if that is true of the general dog population,” said Dr Starling. However it does mean that both individuals and institutions (kennels, dog minders) can have a much more accurate insight into the emotional make-up of their dogs. According to the research a dog with an optimistic personality expects more good things to happen, and less bad things. She will take risks and gain access to rewards. She is a dog that picks herself up when things don’t go her way, and tries again. Minor setbacks don’t bother her. If your dog has a pessimistic personality, he expects less good things to happen and more bad things. This may make him cautious and risk averse. He may readily give up when things don’t go his way, because minor setbacks distress him. He may not be unhappy per se, but he is likely to be most content with the status quo and need some encouragement to try new things. “Pessimistic dogs appeared to be much more stressed by failing a task than optimistic dogs. They would whine and pace and avoid repeating the task while the optimistic dogs would appear unfazed and continue,” said Dr Starling. Dr Starling has been working with Assistance Dogs Australia, a charity organisation that provides service and companion dogs to people with disabilities, to investigate whether an optimism measure could aid in selecting suitable candidates for training. The research not only suggests how personality may affect the way dogs see the world and how they behave but how positive or negative their current mood is. “This research has the potential to completely remodel how animal welfare is assessed. If we know how optimistic or pessimistic an animal usually is, it’s possible to track changes in that optimism that will indicate when it is in a more positive or negative emotional state than usual,” said Dr Starling. 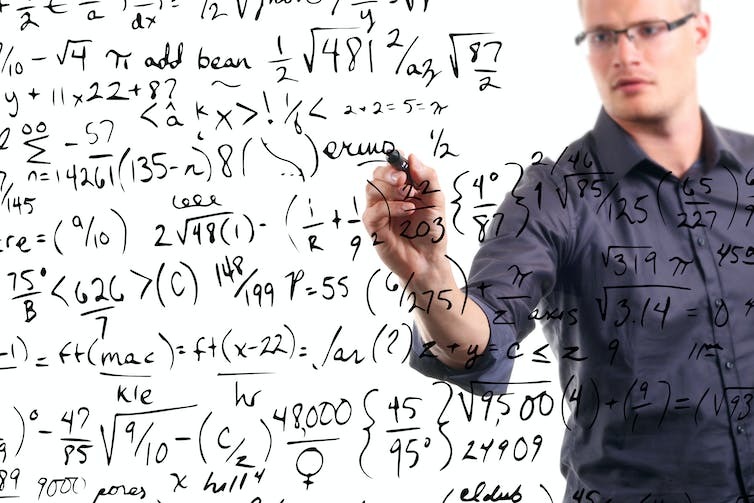 Summary: Calculating the pros and cons of a potential decision is a way of decision-making. But repeated engagement with numbers-focused calculations, especially those involving money, can have unintended negative consequences. Calculating the pros and cons of a potential decision is a way of decision-making. But repeated engagement with numbers-focused calculations, especially those involving money, can have unintended negative consequences, including social and moral transgressions, says new study co-authored by a professor at the University of Toronto’s Rotman School of Management. Based on several experiments, researchers concluded that people in a “calculative mindset” as a result of number-crunching are more likely to analyze non-numerical problems mathematically and not take into account social, moral or interpersonal factors. “Performing calculations, whether related to money or not, seemed to encourage people to engage in unethical behaviors to better themselves,” says Chen-Bo Zhong, an associate professor of organizational behavior and human resource management at the Rotman School, who co-authored the study with Long Wang of City University of Hong Kong and J. Keith Murnighan from Northwestern University’s Kellogg School of Management. Participants in a set of experiments displayed significantly more selfish behavior in games where they could opt to promote their self-interest over a stranger’s after exposure to a lesson on a calculative economics concept. Participants who were instead given a history lesson on the industrial revolution were less likely to behave selfishly in the subsequent games. A similar but lesser effect was found when participants were first asked to solve math problems instead of verbal problems before playing the games. Furthermore, the effect could potentially be reduced by making non-numerical values more prominent. The study showed less self-interested behavior when participants were shown pictures of families after calculations. The study was published in Organizational Behavior and Human Decision Processes. Source: Journal of Consumer Research, Inc.
Summary: What motivates consumers to make ethical choices such as buying clothing not made in a sweat shop, spending more money on fair-trade coffee, and bringing their own bags when they go shopping? According to a new study, ethical consumption is motivated by a need for consumers to turn their emotions about unethical practices into action. What motivates consumers to make ethical choices such as buying clothing not made in a sweat shop, spending more money on fair-trade coffee, and bringing their own bags when they go shopping? According to a new study in the Journal of Consumer Research, ethical consumption is motivated by a need for consumers to turn their emotions about unethical practices into action. “Advocates of ethical consumerism suggest that consumers should consider the environmental and human costs of the products they choose, but unfortunately only a small number of people in North America consume ethically on a regular basis while most consumers just look for good deals and ignore the social impact of the products they buy. Why are some consumers willing to spend time, money, and energy on making more responsible choices?” writes author Ahir Gopaldas (Fordham University). After analyzing dozens of websites of advocacy groups and companies driven by ethical mission statements, and conducting at-home interviews with people who identify as ethical consumers, the author identified three common emotions driving ethical behavior — contempt, concern, and celebration. Contempt happens when ethical consumers feel anger and disgust toward the corporations and governments they consider responsible for environmental pollution and labor exploitation. Concern stems from a concern for the victims of rampant consumerism, including workers, animals, ecosystems, and future generations.Celebration occurs when ethical consumers experience joy from making responsible choices and hope from thinking about the collective impact of their individual choices. Advocates of ethical consumerism should consider the role of emotions in motivating consumers to make more responsible decisions. For example, anger can motivate consumers to reject unethical products and concern can encourage consumers to increase charitable donations, while joy and hope can lead consumers to cultivate ethical habits such as participating in recycling programs. “This research has critical implications for advocacy groups, ethical brand managers, and anyone else trying to encourage mainstream consumers to make more ethical choices. It is simply not enough to change people’s minds. To change society, one must also change people’s hearts. Sentiments ignite passion, fuel commitment, and literally move people to action,” the author concludes.